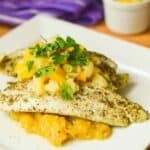 Baked hake fillets recipe – cooked to perfection served on a bed of mashed plantain with a complementary paleo style mango pineapple salsa . Let’s get right into it with the recipe at hand, hake is like my seafood side kick. I have a passion for other types of fish but I’m more partial to hake. Perhaps it’s that succulent, white meaty texture of oven baked hake fillets which leaves me spellbound. I honestly have no idea what grips me with this fish. Whenever I get really creative with various ingredients the taste is magnificent (so I’m told). In short hake is a mild fish, that bears a white flaky texture and it’s exterior is soft, grey with a silver belly . The fish derives from the same family as cod and haddock. However, the only key difference is in the taste, hake is slightly more milder than it’s counterpart. Hake can be found in the pacific and Atlantic ocean. 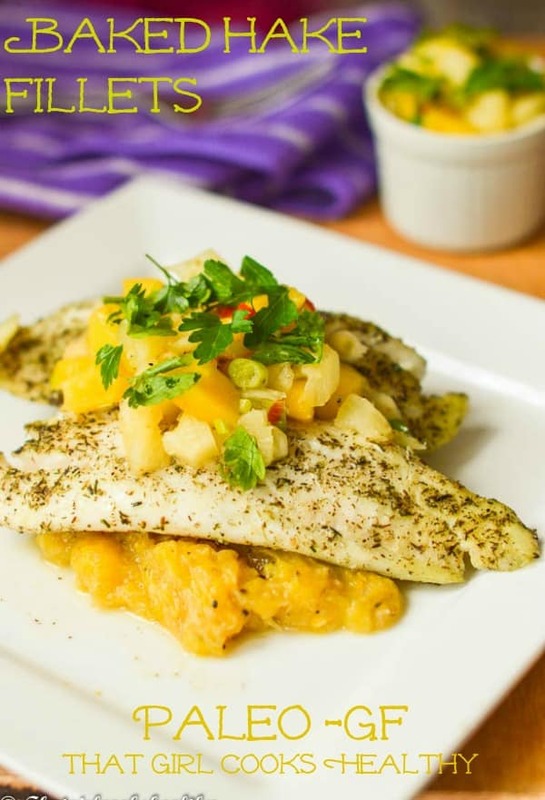 This baked hake fillets pays tribute to the entire Caribbean region as opposed to a specific island. There’s an abundance of flavours; from pimento to thyme and lime (hey that rhymes). 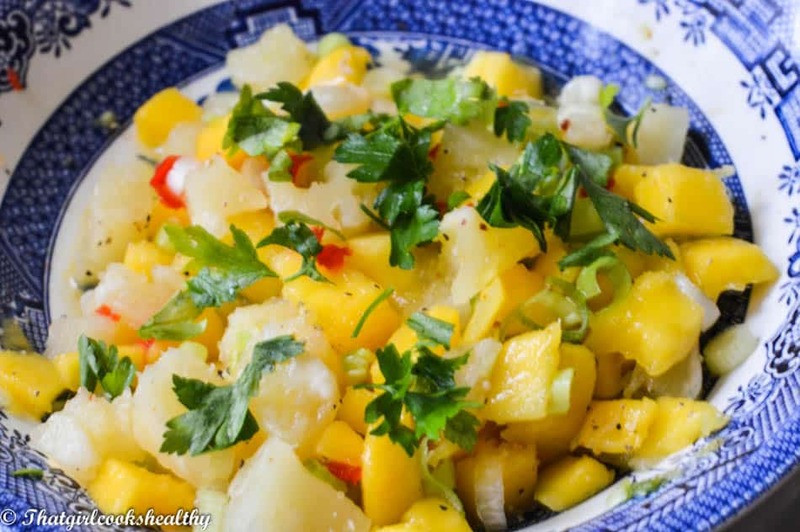 If you’re reading this recipe from the Caribbean I highly recommend sampling this dish with blue marlin instead. Both hake and blue marlin are not only my favourite fish, but share that meaty texture. 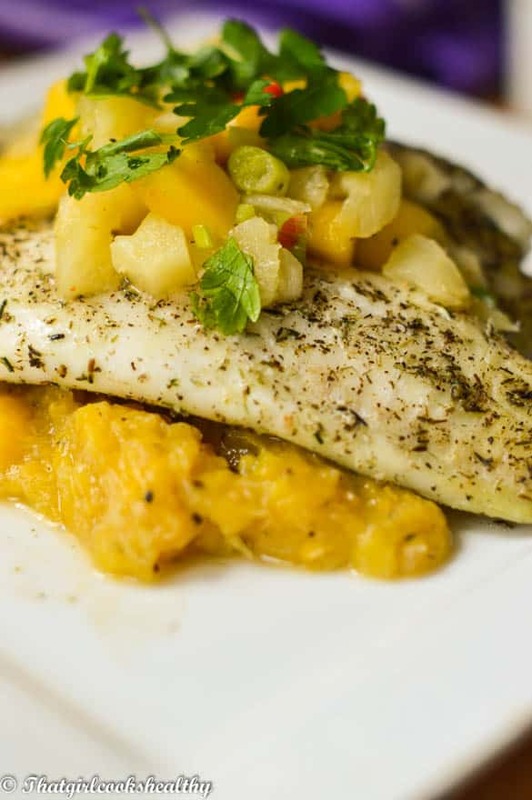 Other method of preparing hake include – steamed hake, hake curry with even pan fried. Is this baked hake fillets recipe hot and/or spicy? The hake is lightly seasoned with thyme, Himalayan pink salt, garlic granules and black pepper – a very complimentary herbaceous fish condiment. The plantain is spiced with ground pimento (all spice) and black pepper given a sweet and subtle peppery kick.The plantain used here is just ripe – dark yellow hue on the verge of turning yellow/black in colour. The more ripe the plantain and sweeter it is in taste and the peel is dark almost black. Is hake good for you? Yes, like most seafood, hake makes for a wonderful source of protein and low in saturated fat. The hake needs to be foil wrapped tightly in order to bake thoroughly in the oven. Another thing, be generous with the fish seasoning, really bathe that fish fillet with the herbs – enhance that flavour. I took a photo of the best way to cut and slice the mango for the salsa. As you can see it looks like a hedgehog in the picture with the pulp pushed up towards. Simply slice around the mango into three sections. Then slice the yellow pulp horizontally and vertically and push the skin so the mango chunks are fully exposed. 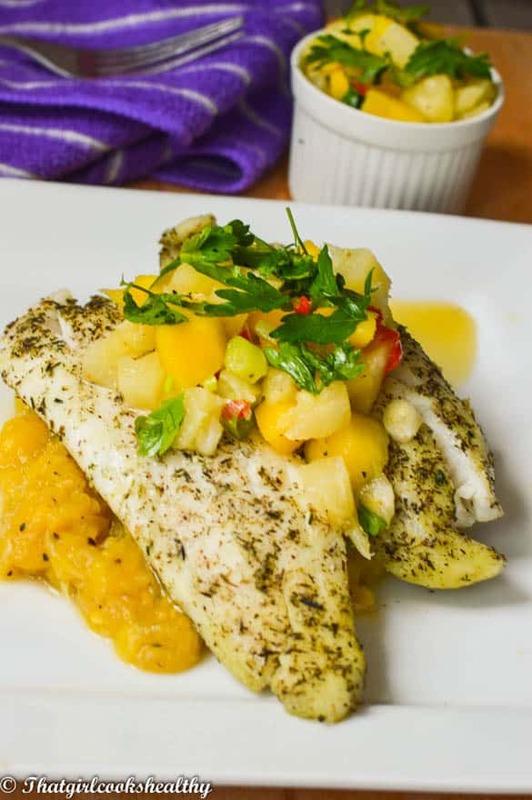 The salsa for the baked hake is very simple to make, it’s simply a case of chopping and slicing the necessary fruit and vegetables, squeeze some lime liberally over the entire contents in the bowl, toss and serve. What can the baked hake fillets be served with? 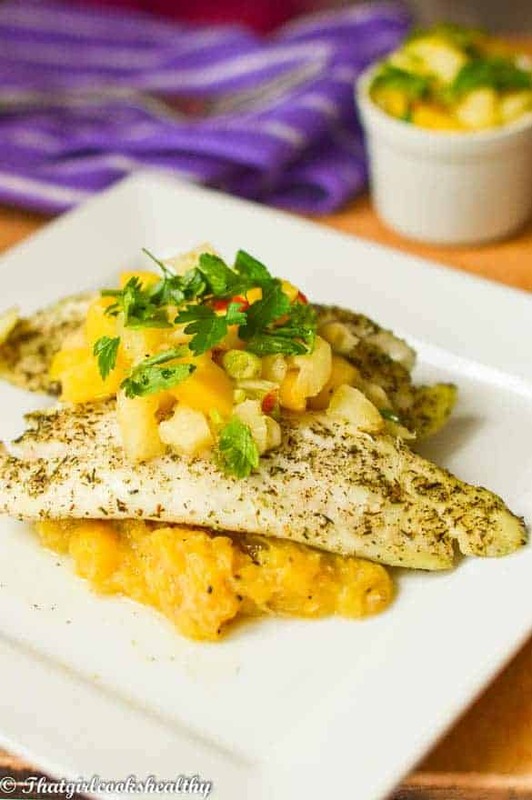 I paired the hake with spice infused mashed plantain rather than frying it – a much healthier cooking method. Plantain is from the same family as banana, more of a starch enriched vegetable (it’s a fruit classified as a vegetable) but cannot be eaten raw. Plantain is often eaten by people from the islands and African continent – a dietary staple, though beginning to gain an astronomical reputation amongst the paleo community – a contemporary food. Preheat the oven at 180 degrees celsius or gas mark 4. Ground the fish seasoning in a coffee blender into a fine powder. Coat the fish fillets in coconut oil, using a silicone brush to lubricate the fish thoroughly on both sides. Follow up with applying the fish seasoning, again using the same technique, both sides with a generous application. Wrap the fillets tightly with foil, place on a baking tray to bake for 20 minutes. In the meantime, remove the skin and cut plantain into two halves, add to a sauce pan with 3 cups of water. Turn the heat high until boiling point has reached, reduce to low to allow simmering for 10 minutes. The plantain should take on a darker colour and tenderise when done. Once soft use a potato masher to break down the plantain into a puree like consistency and mix in the pimento and black pepper. Once the 20 minutes has finished, remove the foil enclosed fish from the oven and set aside to cool. Add all of the salsa ingredients into a bowl and toss so the lime, scotch bonnet and black pepper coat everything. Can use other meaty fish like blue marina or hake instead. Pimento is often referred to as allspice. Store any left over salsa in the refrigerator and use within 2-3 days. Thanks Tekesha, I love Red Snapper too, despite the excess bones. It took me ages to get the photography somewhat perfect, so much appreciated. Charlene, I would never say no this one . How can I ? Plantain is my all time starchy side , Love it! The food pairing just sings to me . Can’t wait for the Caribbean recipes. Hahaha glad I’m not the only one who loves plantain.